The Arab revolutions that promised to overturn the illegitimate regimes that ruled the Muslim world for decades are not over. Syria is presently suffering terribly as a dynastic dictator carries out a brutal crackdown against his own people. Government attacks have been going on for over 10 months and have killed over 5,000 innocent civilians. Just today, at least 44 innocents were killed as regime troops attacked a city with mortars. Over the weekend, a UN resolution against the regime was defeated when it was vetoed by Russia and China. The UN resolution backed by the West was not a Western plan for imperialism, it was supporting a plan dictated by the Arab league – Muslim countries that know very intimately the history of Western colonialism and meddling. It should be noted that Pakistan supported the resolution alongside the Americans. In another Muslim country, another attempt to turn back the tide of democratic change is taking place. In Egypt, the first free elections in decades allowed the people to elect their own leaders and even gave religious parties the opportunity to openly enter politics. Unfortunately, the military has been dragging its feet in letting go of power, and pro-democracy protestors have taken to the streets only to be attacked by their own military. When religious parties won Egypt’s elections, many expected the Americans to step in and support the military in an anti-Islamic crackdown. But something funny happened. Instead of supporting the military against the religious parties as they had done in the past, the Americans supported the Egyptian people. Egypt’s military has reacted by arresting Americans working for pro-democracy NGOs. These stories are fascinating to me because they suggest the possibility of a revolutionary change in the direction of world history. Muslim political history went wildly off course in 1953 when the CIA overthrew the democratic government of Iran. Throughout the Cold War, the nation that supposedly supported democracy actually supported vicious dictators in Muslim countries in an effort to ‘contain’ communism. American support for dictators resulted in suffering across the Muslim world. After a while, it resulted in suffering across the West also. Jihadi groups like al Qaeda struck out against Western countries for their support of the illegitimate regimes that they believed were preventing them from creating a new Khilafat across the Middle East. The West responded to these attacks by supporting the illegitimate regimes even more, creating even more resentment among the people. Despite the West’s fears, a new jihadi Khilafat was never going to rise up. Majority of Muslims didn’t want to get rid of dictators in military uniforms only to replace them with dictators wearing clerical robes. The people wanted to be left alone to rule themselves according to their own laws and their own customs. They wanted the democracy that was taking root in 1953 before history went wildly off course. The Arab Spring, then, was inevitable. What was not known was how the West would react. Would they repeat their past behaviour and support illegitimate regimes in a Quixotic quest for ‘stability’? Or would they return to their supposed principles and support the wishes of the people? Recent events provide real reason to hope that the answer is, finally, a return to principles and the support of the people. History takes a long time to unfold. In the past, the West and especially America has made policies based on short-term thinking. Though it may seem strange, American support for dictators in the Middle East was based on the same short-term thinking as their support for the Mujahideen in Afghanistan. But this short-term strategy brought long-term problems. Just as it takes 100 lies to tell 1 lie, so it takes 100 short-term policies to enforce 1 short-term policy. Today, the Americans are throwing their weight behind Arab League plans for a political transition in Syria, and they are supporting the democratic elections in Egypt even after those elections returned a victory for the religious parties. These decisions might not be in the short-term best interests of American policy, but they could signal the turning of the tide away from short-term thinking to long-term thinking by the world’s super power. If this is the case, we could see 2012 as the year not of an Arab spring, but a global democratic spring. Talk of ‘carrots and sticks’ is often used when discussing American attempts to influence Pakistan’s foreign policy. We have always considered our own carrots to be our willingness to help the Americans in Afghanistan or against India when they were with the Soviet Union during the Cold War. But what now? Today we have an opportunity to increase our influence with the ‘carrot and stick’ of our support for them in return for their support for Muslim democracy. We can bring the Taliban to the table in Afghanistan and help negotiate an end to the war that allows the Americans to leave without losing their pride. In return, we should ask not for aid or weapons, but for continued American support for democracy in Syria, Egypt, and other Muslim countries. Experts debate what shared interests Pakistan and America could possibly have. If the Americans are serious about turning over a new leaf and supporting Muslim democracy, that is certainly one shared interest that our countries share. And it’s not a bad starting point for developing a relationship based on mutual respect that Ambassador Sherry Rehman spoke about recently. More importantly, though, we have the opportunity to help put history back on track and serve our proper role as a guide for democracy in the Muslim world. APP reports that Pakistan and Turkey have agreed to explore further economic cooperation. This is fantastic news, and provides a great opportunity to re-orient the country onto a productive and prosperous path. Actually, looking at Turkey, we may find an alternative way out of the mess that we currently find ourselves in. Foreign Secretary Salman Bashir praised Turkey’s important role for bringing peace and stability in the region. And he is not the only one singing Turkey’s praises lately. On a visit to Istanbul last week, US Secretary of State Hillary Clinton gave the country high marks. “I just want to see Turkey get stronger and more prosperous and have your democratic institutions be even more durable and be an example for so many of the countries that themselves are trying to figure out how to make political and economic reforms,” she told the coffeehouse audience. Clinton went on to note that Turkey can serve as a role model for other new democracies. This is important to think about not because it was praise from an American official, but because the American official is RIGHT. Turkey can be a great role model for how to develop a successful democracy without giving up religion and culture. Irene Khan, Consulting Editor for The Daily Star, made this same observation recently. Under nine years of AKP rule Turkey has changed radically, shedding its military past in favour of liberal democracy and combining strong economic growth and social development with Islamic conservatism and an assertive foreign policy. Turkey’s economy is booming. A member of the G20 group of developed and emerging economies, last year its GDP grew by 9%. The Organization for Economic Co-operation & Development (OECD) predicts Turkey will have the fastest-growing economy in the OECD until 2017. Unemployment has fallen from 14.4% in 2009 to 11.5% this year, and social development programmes are beginning to tackle poverty in some of the more remote and troubled areas. This economic miracle has spawned a new political class of Sunni Muslim businessmen from Anatolia, committed to global market principles but fiercely conservative and deeply religious. They form the backbone of support for AKP and have replaced the military-backed urban elite as the new ruling class of Turkey. Notice however that the “Islamic conservatism” that Khan speaks about is not the same as backwards-looking calls for medieval kalipha systems or Talibani brutality. 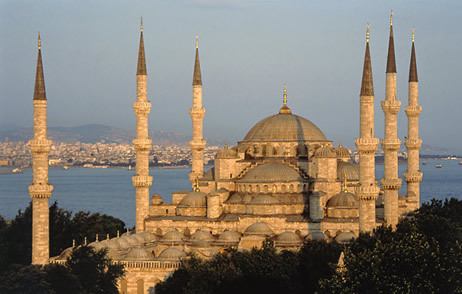 Rather Turkey takes an approach of tolerance for individual religious practice. AKP has been a voice for women who want to choose to wear hijab, but they stop well short of suggesting that the state should be making that choice for women. This is the way of the future for Muslim democracies. Even in Egypt, which many Westerners feared the Muslim Brotherhood would turn the country into a new Iran, the MB is disovering that being in power means that they have to move beyond organising street protests and learn how to govern. As the Arab Spring turns to blazing summer, Islamist movements have quickly formed political parties and mobilized national campaigns designed to unveil their new image before elections in the fall and winter. Paranoid rhetoric about threats to Muslim identity have given way to political messaging that could have been lifted from the party platforms of any Western democracy: It’s all about jobs, investments, inclusiveness. A new broom to sweep clean decades of corruption. A new dawn of can-do Islamism. And governance is the key because people take responsibility for their own souls – from the government they expect results. The group has long been feared in the West as the source and exporter of radical Islamist ideology: violent groups like the Palestinian Hamas are direct offshoots of the Brotherhood. Some scholars trace the origins of terrorist groups like al-Qaeda to the Islamists. In Egypt, however, the group long ago rejected the rhetoric of violent jihad, and it is seen as a social movement as much as a political entity. Egypt’s poor have long associated the Brotherhood with its social services, like free clinics and schools. President Zardari is meeting with regional leaders like Ahmedinejad as he should. After all, these are our neighbors whether for better or for worse. But it is our ties with nations like Muslim nations that are looking to the future – not the past – that has the most promise for improving our own path. Turkey and Egypt are giving a glimpse at the future of Muslim democracies in Europe and the Middle East. Pakistan should follow this path of democratisation and restore its place as an example for Muslim democracy in South Asia. This was the dream of Quaid-i-Azam Muhammad Ali Jinnah. It is up to us to make it real. The Raymond Davis case continues to be passed around like a bowl of sour milk that no one wants to end up with. After the Foreign Office neglected its duty to determine the American agent’s diplomatic status and passed the case on to the LHC, the LHC has now determined that it too does not want to be responsible for making the determination and has passed the case on to the trial court. Meanwhile, religious groups continue to use the case to organize protests and conspiracywalas in media are making a picnic out of fears of American agents roaming the country and undermining Pakistan’s democracy. But while the hue and cry against American agents interfering against Pakistan’s sovereignty, hundreds of foreign fighters have been entering another Muslim country to undermine its own democratic movement and nobody seems to be paying attention. The people of Bahrain, following the example of Tunisia and Egypt, are attempting to rid themselves of a corrupt and brutal regime. The country’s rulers have responded by cracking down on pro-democracy protesters and declaring martial law. But those enforcing the corrupt government’s rule are increasingly foreign agents recruited to stamp down on pro-democracy protestors. But these foreign agents are not from the US – they are from Pakistan. According to the Ahlul Bayt News Agency, a classified advertisement entitled “Urgent Requirement: Manpower for Bahrain National Guard” was recently placed on the website of a prominent Pakistani human resource firm that has close ties to the Pakistani military. The advertisement said Bahrain was seeking to hire several categories of ex-military personnel, including anti-riot instructors, Pakistan Military Academy drill instructors, retired infantry majors, and military police. The advertisement added that a delegation from the Bahrain National Guard would be visiting Pakistan for the purpose of selecting the Pakistani personnel from March 7 to March 14. It is difficult to confirm the exact number of former Pakistani soldiers who have been recruited in response to the recent ad, but sources claim as many 800 Pakistanis have been hired in the past few weeks. Human rights activists have long complained about the controversial practice of hiring large numbers of foreigners to serve in the Bahraini security forces to suppress political dissent in the kingdom. Bahrain’s police, military, and national guard are staffed in large part by non-Bahraini citizens, mostly from Pakistan, Yemen, and Syria. It is bad enough that the complaints against foreign agents in Pakistan are shown as sheer hypocrisy on the world stage, but there is a much more dangerous element to this story that must be examined. Pakistanis recruited to serve as pro-regime agents in Bahrain are not only undermining democracy in a Muslim state, they are also stoking sectarian tensions. Earlier this year, Syed Nadir El Edroos asked ‘Will Bahrain’s sectarian divide impact Pakistan?’ In his post for Express Tribune the author makes an important point. What makes events in Bahrain relevant to Pakistan is the sectarian divide in the country. The Sunni minority in Bahrain has monopolised power while the Shia majority is systematically marginalised from public influence and control. With Saudi Arabia’s support, the Shia population has been systematically oppressed, as the fear of Iranian influence in Bahrain is considered a strategic liability. 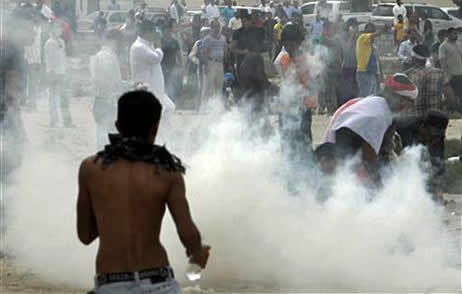 Bahraini security forces recruit from across the region. Pakistanis, particularly from Balochistan along the Makran coast, are favoured recruits. These Pakistanis are viewed as instruments of state oppression by the protestors. If the Bahraini regime were to fall, Pakistan as a willing supplier, nay ‘facilitator’ of Bahraini recruitment will not be viewed favourably by a new set of leaders. Pakistan’s involvement in sectarian tensions in Bahrain could result in an even more dire outcome for our own country because it threatens to worsen sectarian tensions not only within our borders, but with our neighbor to the West the Shia state of Iran. Pakistan itself is no stranger to sectarian violence, which has intensified in recent years. If the Bahraini regime falls as the Saudis and American’s fear, it would be seen as and portrayed by Iran as a victory of her interests. This would push the Saudis to intensify support for organisations that share it’s goals of containing Iran. Such support for organisations in Pakistan, could lead to sectarian attacks and reprisals. Though Nadir warns of this outcome in his post, I fear he misses the more important point. The correct strategy to protect Pakistan’s security is not to prop up the corrupt and anti-democratic regime in Bahrain, but to support democracy and the people of Bahrain deciding their own government. We must not take part in the same interventions that we complain of within our own borders. We must face the fact that we have our own Black Water and that our own agents are propping up corrupt and anti-democratic regimes in Muslim countries. This not only undermines any moral authority we have to complain about foreign agents on our own soil, but in the worst case it threatens to undermine our own security as we experience ‘blow back’ from sectarian violence.